Electric Fireplaces are easy, convenient and cost-effective to install. This category comes in a variety of styles, such as Traditional Electric Fireplaces and Contemporary Electric Fireplaces. 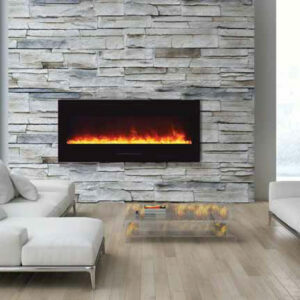 Whether you’re converting a wood fireplace to electric, installing a wall-mounted electric fireplace, or installing a built-in electric fireplace, Rettinger is a one-stop-shop for electric fireplaces in South Jersey, electric fireplaces in Philadelphia, and electric fireplaces in the Jersey Shore. Built-In Contemporary Linear Electric Fireplaces are very popular in South Jersey and Philadelphia. Want the contemporary look of installing a TV over a fireplace? No problem. Rettinger Fireplace can help you create a design concept of your liking, and will employ their custom shop along with your electrician to bring the concept to completion. Customers looking for a built-in contemporary linear electric fireplace should consider Amantii, Dimplex and Napoleon electric fireplaces. Models range from 36” all the way to 90” wide! Wall-Mount Contemporary Linear Electric Fireplaces save you the added expense of building a wall enclosure with finish materials. Simply pick a location on your wall, determine the source of power, and you’re ready to install an awesome electric fireplace to your wall. Another benefit of wall-mount electric fireplaces is the multi-colored backlight feature, which can be controlled via remote, available on certain models and the shallow depth projection into the room. Check out Amantii and Simplifier for this category! Built-in Traditional Electric Fireplaces give you the nice ambiance of a wood fire without the mess or odors of burning wood. House your electric fireplace in a wall, cabinet, or enclosure of your choosing, determine source of power, and you’re ready to install a beautiful, built-in electric fireplace. These models range in size. We recommend customers review the Simplifire and Amantii product lines for built-in traditional electric fireplaces. Electric Fireplace Inserts are a great resource for homeowners with a failed/poor chimney inspection. If your fireplace has been condemned or the expense of a chimney repair is extravagant, then considering an electric logset or insert might be your best solution. Some prefab fireplaces already have a source of power and are ready to install an electric insert. Others may require an electrician for power. 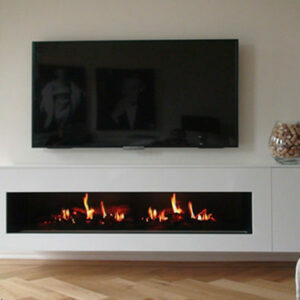 Amantii, Dimplex, Optymist and Napoleon all offer very attractive electric logs and inserts. No gas, no problem. In certain applications, the cost of running a gas line may seem like a limitation, but with electric fireplaces & inserts, installation is sometimes just a nearby outlet away. Electric Fireplace Provide 4,900 BTUs of Heat Output, equivalent to a space heater. Electricity is an abundant and cost-effective resource for South Jersey electric fireplaces, Philadelphia Electric fireplaces and Jersey Shore electric fireplaces. We proudly provide electric fireplace installations and electric insert installations in Camden County, Cape May County, Atlantic County, Gloucester County, Burlington County, Cumberland County, Ocean County, NJ and Philadelphia / Mainline PA.